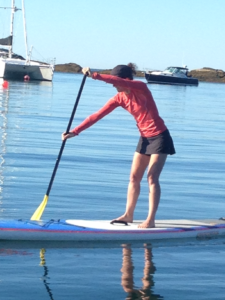 Melissa shows good form as she Stand Up Paddles, SUP. Put the paddle in, then hold it steady as you press the top of the paddle forward-left hand. hold steady with the low side of the paddle-right hand, not letting it slip or squiggle in the water. Let the board move past the paddle. Apply this to swimming. Use your lead hand, the right hand in this photo, as the “paddle.” Let the lead right hand move toward vertical-like Melissa’s paddle-to find a little pressure on the hand and forearm. Simultaneously bring your attention to the high side, the left hand and hip in this photo, the recovery hand that is now slicing back in. Like Melissa’s left hand on her paddle in the above picture, focus on the high side extending forward by pressing on the low right hand-don’t let it slip! By combining the pressure on your right hand “paddle” and using gravity of the high side energy of the left hand and hip of the swimmer, the body moves through the water- like the board. Put your attention on going forward, not pulling back. Bottom line, swimming is like paddling: focus on the high side going forward, not the bottom hand pulling back.